This remarkably simple 19-th century optical experiment can confirm that, indeed, the intensity of light decreases like 1/R2 , where R is the distance from the source. It also drives home the fact that physical measurements are often comparisons to a standard. A two-pan balance does not measure weight--it compares it to that of a set of standard weights. A surveyor compares distances to a baseline, a Wheatstone bridge compares electric resistances to a given resistance standard, and so on. Here you compare the brightness of pairs of light sources, with intensity ratios 1:1, 1:2, 1:3 etc. - - one for multiple candles. 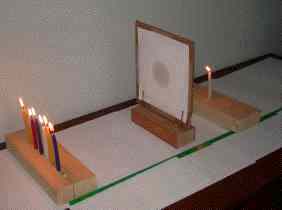 A block of wood with holes in a row was used (a Jewish Hanukkah candelabrum, one that does not rise too high, will also do and provides a multi-cultural touch). Unfortunately, candles may flicker, which makes the experiment less accurate (large household candles flicker less). - - a set of 5 or more such bulbs, powered by an equal voltage. A candelabrum (e.g. an electric version of Hanukkah lights) will work here too, and by slightly unscrewing some bulbs, you can get it to shine with 1,2,3.... bulbs. The experiment will work even if the candelabrum uses bulbs different from the single one (we leave it to you to figure out why). - - You also need a block of wood, say, 2 x 4 x 8 inches (5 x 10 x 20 centimeters), and a piece of corrugated cardboard, about 8-10" (20-30 cm). Taking care not to buckle the cardboard but keep it flat, cut in it a smaller window, and tape to it a sheet of white paper. That will be your screen. The experiment is performed on a table top. Attach the screen to the block, so that is stands perpendicular to the table. The screen shown here was held by two pairs of small-head ("finishing") nails driven into the block; the nails of each pair were close to each other, and each slightly slanted towards the other, so that they pressed the cardboard between them. With a tiny dab of oil, butter or margarine, make a round grease spot in the middle of the paper. The spot should be translucent: some light can pass through other parts of the screen, too, but much more shines through where the spot is. - - Finally, you also need a yardstick (a green one in the image), or some means to measure distances across the table on which the experiment is performed. A sheet of paper, on which you mark with pencil the position of the single light source (A), the (numbered) positions of the multiple ones (B) and the corresponding ones of the screen (S) will also do; later, you measure the distances between the marks. The single candle (or lightbulb) is raised at one end, the multiple light sources on the other end (they should be lined up perpendicular to the direction of the yardstick, at the same height as the grease spot). The block with the paper screen should be placed between them, with the screen also perpendicular to the direction of the yardstick. A pen mark on the block should allow you to measure the distances (R1, R2) from the screen to the (single, multiple) light sources. The experiment is best performed in a moderately dark room and makes a nice classroom demonstration. Light the single candle (or bulb): you will find that seen from its side, the spot is dark. Let us assume the white paper reflects 94% the light, letting through only 6%; the spot lets through more, say 38%, reflecting only 62% (any other numbers will do just as well). Because less light is reflected from the spot, it looks darker. Seen from the side far from the candle, the spot is bright, because light is coming through it. Outside the grease spot, only 6% of the light intensity manages to shine through the paper; inside the spot, 38% does. Light another candle or bulb on the other side and move the screen up and down the yardstick. As it approaches either end, the spot looks dark from that side, bright from the other. But in the middle, there exists one distance at which the spot disappears. Make sure: it should disappear (or anyway, have the same appearance) when seen from both sides. At that distance, each side is illuminated with the same intensity. On each side, 38% of the arriving light passes through, but that is exactly balanced by 38% of the light from the other side emerging from the spot. Whatever the percentages--both sides are illuminated with equal brightness, the light going out through the translucent spot exactly equals the light coming in from the other side. What does the inverse-square law say? When the spot disappears, we expect I1 = I2, and we get R1 = R2 . The screen should be in the middle. x = N (=no. of candles or lights). and should get a straight line y=x, at 45 degrees to each axis.